Thoroughbred people, did you ever wish you could ask an honest-to-goodness jockey to ride your horse and tell you how he felt? I am fortunate enough to be in that position. I’ve known Shannon Uske since she was 8 years old and we’ve boarded at a few of the same barns. She is unique in the horse world, since she is a professional jockey and she also rides her own jumpers at home. After I finished my ride, I asked her to take a quick spin on Wizard and tell me how he felt. As expected, Wizard trotted out confidently with his rider, because she has a great feel for a horse and possibly because I far outweigh her ;^) There was no unevenness, but she could feel the action in his hind legs that I felt. She liked how responsive he felt and said he has a nice soft mouth. My ride was about 30 minutes long, including warmup. First, I free longed him for a few minutes- for Wizard, free longeing has all the benefits of longeing without the wear and tear on the joints that repeated circles can cause. I ask him to trot out in each direction so I can assess his gaits and mood, then I tack up and ride. This was our best ride so far this spring. There was a lot less of the ear-pinning behavior and a more forward, confident trot. 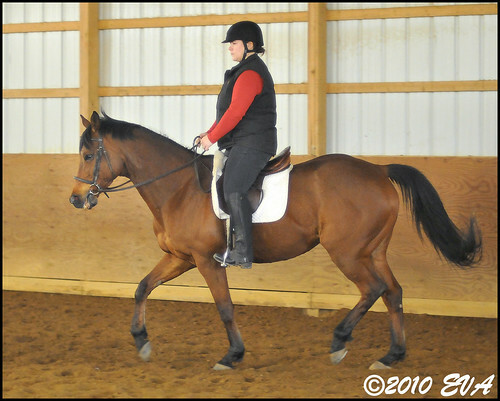 Once he was warmed up, he stretched down into the bit, just like he did last year during my lessons with Sarah. His trot was more rhythmic and he was moving forwardly. He did not mind being the only horse in the arena, and all the activity outside did not bother him at all. When our ride was over, I opened the gate to the arena while still in the saddle, and walked out. I rode Wizard up to the gate of the outdoor arena, unlatched it, rode in, and closed the gate. We’re taking the trail world by storm, people! Wizard look so handsome in your photo. Since you bringing Wizard into the trail world, I thought I might mention the book Beyond the Homestretch, which was written by a woman now located in Texas who rescues Thoroughbreds no longer able to race and find homes for them that include new jobs for which she thinks they will be suitable. Lynn Reardon is her name and her style of writing is very entertaining, as well as informative. Hope you’ve read it or will read it. Also, Basic Training for a Safe Trail Horse has information that could be helpful for you in teaching Wizard how to confront what he will find out in the trail world. This one is a small paperback narrative that describes how recreational riders can learn to relate to a horse without using fear factors and teach the horse in ways that it can clearly understand what a rider wants. It will give you new ways of thinking about how to communicate to a horse that only require patience to be insistent, persistent, and consistent.